Well folks, it’s been a while, so it’s time for a good ol’ fashioned BA debunking. Pretty, isn’t it? 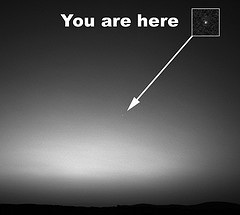 You can find endless copies of it online; just search on the term “mars skyline”. It’s been picked up on tons of Tumblrs and other social media. But yeah, there’s just one problem: it’s not real. I knew right away it wasn’t legit, but it’s hard to say exactly how. I’ve run into this problem before; I have a lot of experience looking at space images, and you just get a sense of what’s real and what isn’t. This one screams fake. The landscape color is a bit too saturated for Mars*. The sky’s the wrong color. The clouds are too numerous, the wrong color as well, and they have that “rendered by software” look to them. See? The arrow points to the letters, and I zoomed in and enhanced the brightness and contrast a bit. The letters are “NE“. As in, “northeast”. This is exactly what you see when you use planetarium software on a computer to display the sky. Programs like Starry Night, SkySafari, and so on will put the cardinal directions (north, south, and so on) along the horizon to indicate what direction you’re looking. And many of them will display the appearance of the sky from other planets. It’s clear that’s what we have here: a rendered view from Mars using planetarium software. I’m not sure which one (there are quite a few packages available) but I bet someone out there in BAland would recognize it. Any takers? Mind you, the picture itself isn’t a hoax! It’s just a computer generated image probably meant to represent a real scene. But it got spread around the net, and before you know it people think it’s real. I’ll note that I love that people think images like this are so beautiful and interesting that they pass them around and get a sense of wonder from them. But it bugs me that it’s possible that an unreal picture gets treated as real. In this case there’s no harm done, but it’s not hard to imagine a case where a forged image showing something damaging to someone’s reputation gets treated as real and spreads like wildfire. It’s happened before, many times. The problem here is that people pass it from one place to another without attribution, without a link to the original source (usually it’s linked to the place they got it from, one link down the line in a very long chain). In this case, I searched for a while and still have no idea where the original for this came from. It got picked up wholesale from blog to blog and Tumblr to Tumblr so rapidly that the pedigree of it got lost. Maybe someone more patient than me can find the source. I’ve been fooled on Twitter by fake posts before, too. Everyone has at some point. I’m just glad to be able to interject a little dose of reality in this case. And remember: we have actual, real, amazing, breath-taking images coming from Mars right now. And the fact that they are real, and mean we have a presence on another world, is far more moving and stirring than any fake could ever be. * I’ll note that the color of the landscape in the picture does look similar to that from the old Viking images of Mars from the 1970s. The color of those images was probably too saturated when displayed, in my opinion; getting the color right in those old shots was actually fairly tough. - A fake and a real view of the solar eclipse… FROM SPACE! - NASA FAKED A SHUTTLE IMAGE!!!!! (a joke post I put up that some folks took seriously; see the followup post for more silliness) - Holy UFO hoax!